The Ivy Project, led by Sharon Kallis, was a community-involved public programming initiative born out of the Stanley Park Environmental Art Project. Vancouver artist Sharon Kallis works with unwanted natural materials. Through engaging local community in common handwork, unwanted materials are re-purposed into something new, creating opportunities for individuals to connect with nature in a unique, meditative, yet community oriented way. Run in partnership with the Vancouver Park Board and the Stanley Park Ecology Society, the Ivy Busters program has removed more than 3.95 hectares of invasive species from Stanley Park since 2004. 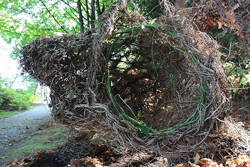 The intent of The Ivy Project was to create art installations that use the biomass that is unwanted and create opportunities for learning about the ecosystem of the park; is a creative method for observation and turns a material with negative impact to potentially good uses. The Ivy Project saw over 180 volunteer community members turn mounds of English ivy into crocheted small bird net forms, woven nurse logs, a knitted boat, and a knitted anti-erosion blanket. Please visit The Ivy Project website for more information and photos on this unique project. Read an interview with Sharon Kallis by John K. Grande where Sharon goes into more detail around the process of re-purposing the ivy and working with SPES and community members on The Ivy Project. via Vancouver Park Board – Arts.